Modern hearing aids come in many shapes and sizes, and are packed with awesome technology. Many of the hearing aids can connect to your mobile phone, TV and other devices. Read more about that on the Connectivity page. More importantly, hearing aids make it easier listen. So you spend less energy straining to hear and more time enjoying life! Hearing aids have moved on from simply amplifying sound. In order to listen well in complex environments (e.g. at a social gathering) your brain needs the right kind of sound information. Inside the hearing aid is an extremely clever, tiny little computer applying lots of algorithms to the incoming sound. It sounds complicated, but don’t worry. It does the work so you don’t have to. All you will hear is lovely natural sound that’s easy to listen to. One of the most important algorithms is the noise reduction system. Loud noisy environments are a big challenge for many people with hearing difficulty. Modern hearing aids reduce the background noise so that it’s easier for your brain to follow conversations. Some hearing aids do this better than others, and it’s one of the main reasons why some hearing aids cost more. 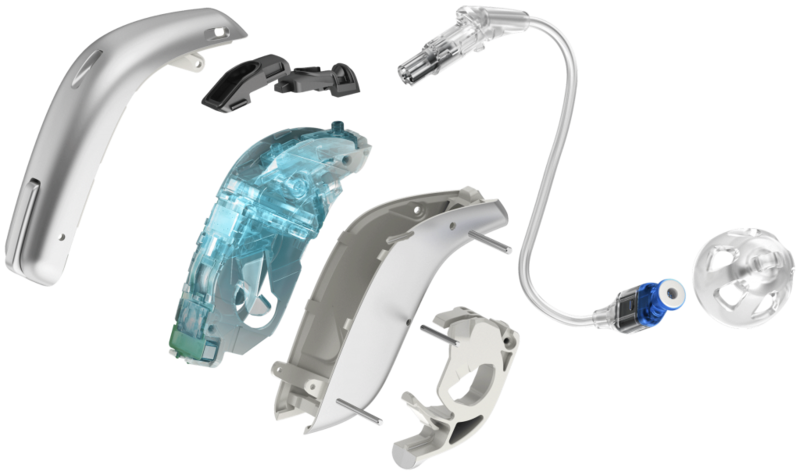 Once you’ve chosen the style and colour of your hearing aids, we will configure it to suit your needs. We connect your hearing aids to special laptop software that allows us to personalise the devices for your audiogram (hearing test results) and listening preferences. All hearing aids have the same basic parts – a microphone, processor and receiver. Other parts are optional. It is important to discuss with your Audiologist what type of hearing aid will work best for you. Microphones: Sound is picked up by one or two microphones on the surface of the device. Processor: That incoming sound is then converted into digital code and sent to a processor (a tiny little computer). Once the sound information has been processed, cleaned up and amplified, it is converted back into real sound and sent to the receiver. Receiver: The receiver is a little speaker, which delivers the amplified sound to the ear. Battery Compartment: Hearing aids run on batteries, and so they need a place to house the battery. A battery door on the outside of the hearing aid allows you to easily replace the battery when needed. Buttons: Some hearing aids have one or two little buttons on the surface that allow you to control the volume and/or other settings. Most hearing aids are so clever that you they adjust the volume and programmes for you. But some people like to have the option to control their devices. Wireless Radios: There are various types of magnetic coils and wireless radios inside hearing aids. These radios connect the hearing aids to phones, TV, loop systems and more. It can be complex to navigate the options, but we will help you decide which options you need.